After leaving Wyperfield National Park I hit the road again and continued my journey east along the Mallee Highway, through the towns of Ouyen, Kulwin, Manangatang, and then Piangil, heading for the Yanga National Park (NP) VKFF-0554, near my intended overnight stop at Balranald in the far southwest of New South Wales (NSW). After reaching the junction of the Mallee Highway and the Murray Valley Highway I turned left and headed into the little town of Tooleybuc. This is where you cross over the mighty Murray River which forms the border between the States of Victoria and New South Wales. Tooleybuc is the home to a historic bridge which was constructed in 1907. The bridge was designed to rise to allow paddle steamers to pass through. I stopped briefly here for a photo stop and some lunch, and then made a shot detour into the Tooleybuc cemetery to take some photographs of some headstones, as family history is another hobby of mine. I then continued north on the Mallee Highway, passing through the little town of Kyalite, and on to Balranald. I booked in to the caravan park, and offloaded some of my gear, and I then headed back out to the Yanga National Park. If you are passing through this area, I would highly recommend the caravan park here at Balranald. It is situated on the banks of the Murrumbidgee River, which is Australia’s second longest river and is a major tributary of the Murray River. I stayed in a self contained cabin which was very clean and contained all the required essentials. 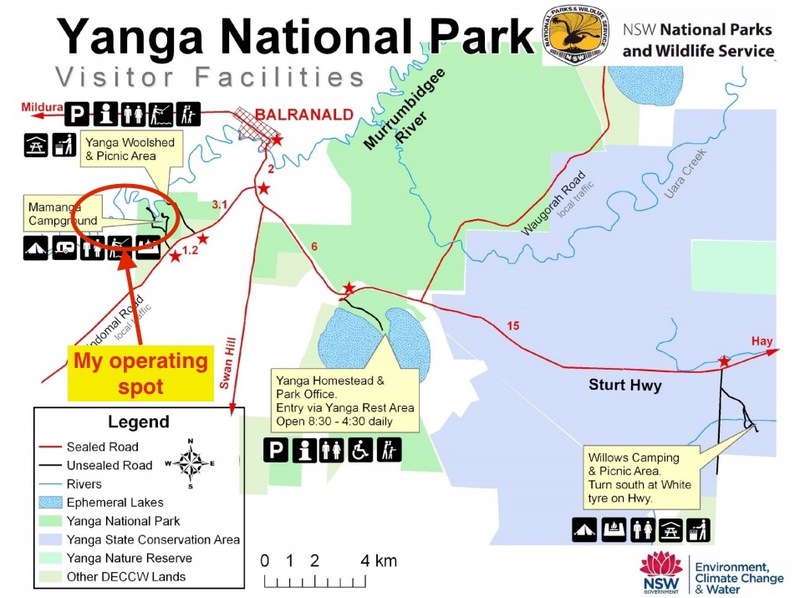 I accessed Yanga National Park via Woolshed Road, which runs off Windomal Road to the south west of Balranald. This part of the park is very well sign posted. You can also access the park off the Sturt Highway. Yanga National Park was established in February 2007 and is a large park, comprising 667,334 hectares. It has a 170 km frontage on the Murrumbidgee River. The park was formerly an important pastoral station which was established in the 1830’s, by explorer, William WENTWORTH. Yanga Station was in its time, the largest privately owned station in the southern hemispherem covering 210,000 acres including the historic Yanga homestead which was built in around 1870. In July 2005, the NSW Government announced that it had purchased the station with the intention of creating a National Park. About 2 years later, on the 28th February 2007 the park was gazetted as a National Park. 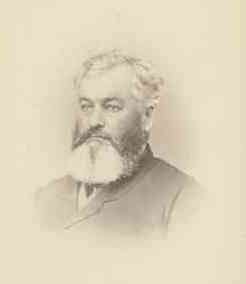 Above:- William WENTWORTH. Image courtesy of Wikipedia. Over 300 plant species have been documented in the Yanga National Park. The park comprises River red gum forest and woodland, black box woodland, and lignum/nitre goosefoot shrubland, and spike rush dominated sedgeland. Yanga NP incorporates a number of wetlands and as a result, a large amount of native wildlife can be found in the park. A total of 24 reptile species including geckos, goanna, dragons, skinks, snakes and turtles can be found in the park. A total of 18 fish species also call the park home. And around 33 mammal species and about 150 species of birds can also be found in the park. The number of bird species varies dependant on the amount of water in the wetlands. Prior to activating the park I stopped off at the historic Yanga woolshed, which when constructed, was once the Riverina region’s largest. The wooldshed was built during the late 1800’s and housed 3,000 sheep and provided work for up to 40 shearers at a time. Yanga was a working woolshed up until 2005. There are a number of interpretive displays in the shed which give you a great insight into the history of the woolshed. If you visit the park, this is a must see. After visiting the woolshed I headed to the Mamanga campground area, and followed the dirt tracks to a nice quiet spot alongside the Murrumbidgee River. There were plenty of options, with a number of campspots alongside of the river. Should you decide to camp here, there are great facilities including picnic tables, wood barbecues, and toilets. For this activation I again ran the Yaesu FT-857d, 40 watts, and the 20m/40m linked dipole, supported on the top of the 7 metre telescopic squid pole. There was a strategically placed wooden table and benches in the camp ground I chose, so I secured the squid pole to the table with the help of a long octopus strap. As it was a nice sunny day, I also had the solar panels out to top up the battery. I was on air and ready to go by just after 0500 UTC (4.00 p.m. New South Wales local time). I headed for my nominated operating frequency of 7.144 and started calling CQ. My CQ call was answered by the ever reliable John VK5BJE who was a very nice 5/9 signal to Yanga. This was followed by another park devotee, Mick VK3PMG, and then Rob VK4AAC who was portable in the Kelvin Powrie Conservation Park, VKFF-0899. After working a total of 31 stations on 40m in VK2, VK3, VK4, VK5, and VK7, I lowered the squid pole and removed the links in the dipole and headed for my nominated operating frequency of 14.310. Once I got there I found that the frequency was already occupied by another WWFF park activator, YP1WFF in Romania. Unfortunately they were a little low down for me and had a very big pile up from Europe. I gave half a dozen calls but soon realised that it was going to be very very difficult to break through. So I headed up to 14.315 and started calling CQ. Sadly I had no takers there, so I decided to head down a little lower and started calling CQ on 14.299. This was answed by Mike VK6MB in Perth in Western Australia with a good 5/5 signal to New South Wales. Not bad considering that is a distance of about 3,000 km. We call that a local contact down here in Australia. There are many other parts of the world where that would be DX, with multiple countries in between. My next caller was Jozsef HA6NF in Hungary, followed by Luciano I5FLN in Italy, and then Max IK1GPG in Italy. The 20m band on the long path into Europe seemed to be in reasonable condition, and I had a good steady flow of callers from Hungary, Italy, Slovenia, Germany, Russia, Israel, Slovak Republic, Switzerland, Pol;and, and Estonia. Many of the callers were the regular European WWFF park hunters, but there was a scattering of new callers. But the European run did not last for long and after working 19 stations on 14.299, things went very quiet. So I took the opportunity of having a look across the band. I found special event station LZ130SAK in Bulgaria calling CQ on 14.213 with a good 5/9 signal. After a few calls I got through. I then found FM/VE8DX with a massive pile up on 14.188. It would have been a real thrill to get Martinique Island in the log, but the pile up was huge from Europe and it just wasn’t worth a shot. I also heard PJ2/IK7YTT on 14.216 in Curacao, but again the pile up was enormous. I then found a clear frequency on 14.275 and called CQ and this was answered by WWFF parks activator and hunter, Swa ON5SWA with a 5/7 signal from Belgium. Two more Belgium stations followed, Gilbert ON4GI and then Luk ON4BB. I worked a further 43 stations from Belgium, Russia, Italy, Czech Republic, Spain, Ukraine, Austria, Sweden, Germany, France, Poland, England, Luxembourg, and Estonia. After things had slowed down on 20m I headed back to 40m to see if I could get some of the park desperados in the log. Unfortunately I could not get back onto 7.144 as the frequency was occupied by some European stations. And I did find it hard to get a clear frequency as there were some very good signals coming in from Europe. I called CQ about 7 or 8 times on 7.150, but unfortunately had no takers. It was 6.30 p.m. local time and I was starting to get hungry. So I packed up the gear and headed in to Balranald to the local pub for a few cans of Bundy rum and coke, and a nice feed. I was very happy with this activation, with a total of 94 contacts in the log. But there was a hitch with this activation. John VK5BJE and a few others pointed out that they believed Yanga National Park was in fact now known as Murrumbidgee Valley National Park. It was also pointed out that on the WWFF Australia website, both Yanga and Murrumbidgee Valley had the same VKFF reference number. I now vaguely remember reading about these 2 parks when I become the VKFF co-ordinator. However, all of the park signs referred to Yanga National Park. 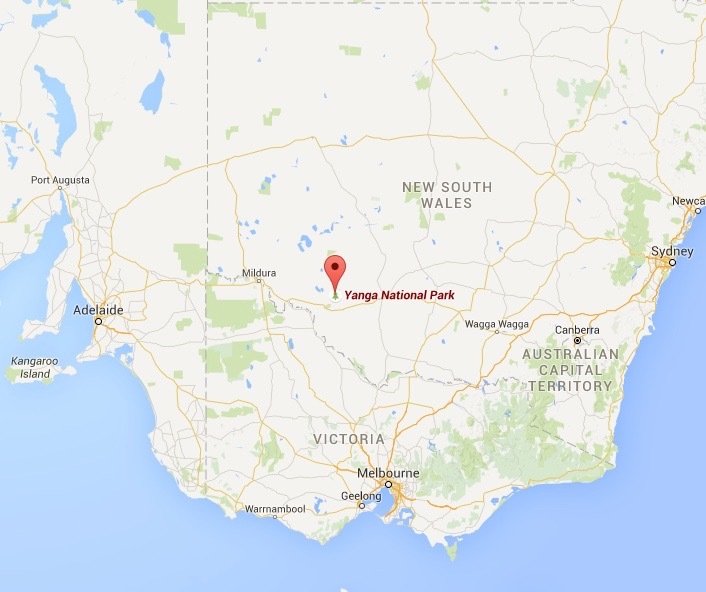 The NSW National Parks website states ‘…Also known as Murrumbidgee Valley National Park….”. I am now awaiting official word back from NSW National Parks and Wildlife and hope to sort out this issue. NSW National Parks and Wildlife Service, 2015, <http://www.nationalparks.nsw.gov.au/things-to-do/historic-buildings-places/Yanga-Woolshed&gt;, viewed 3rd November 2015. Wikipedia, 2015, <https://en.wikipedia.org/wiki/Tooleybuc&gt;, viewed 3rd November 2015. 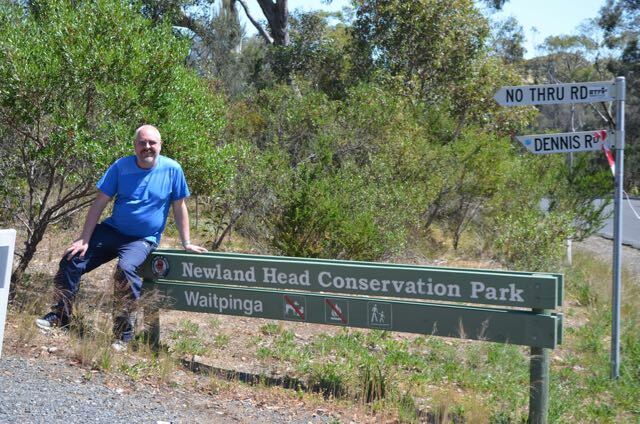 My first activation for the Wagga Wagga trip was the Wyperfeld National Park, in Victoria, which qualifies for the Keith Roget Memorial National Parks Award (KRMNPA) and the World Wide Flora Fauna (WWFF) program. I have activated Wyperfeld previously, back in November 2013 as part of the 2013 KRMNPA Activation Weekend. But I had fallen short of the required 44 QSOs for the WWFF program. In fact I had 43 contacts in the log. Not sure what happened there? So my activation at Wyperfeld was going to be a quick one as I only needed 1 contact to qualify the park. It was a bright and early start to the day (Thursday 22nd October 2015). In fact it was a 5.15 a.m. rise out of bed. No sleep in for me on my days off. But, I am normally up around this time anyway to head off to work, so it wasn’t so bad. All up, I had a 500 km drive to my intended first overnight stop, which was Balranald in New South Wales. And it was 300km to Underbool in Victoria, from where I intended to access Wyperfeld. 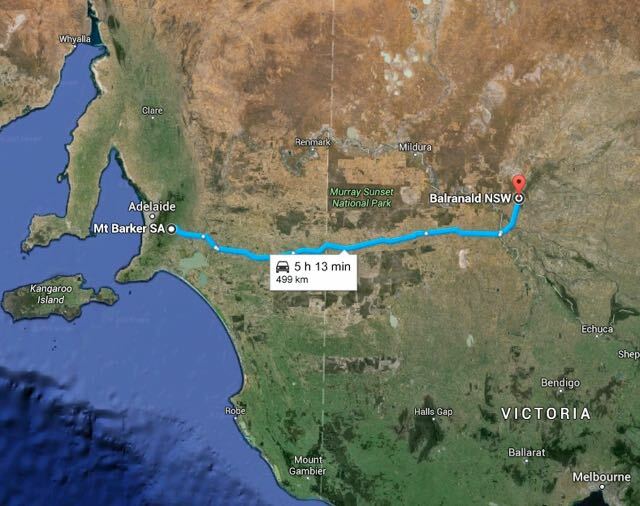 Above:- Map showing my drive from Mount Barker in South Australia, to Balranald in New South Wales. Map courtesy of google maps. After leaving home I headed east on the South Eastern Freeway and travelled over the mighty Murray River at Murray Bridge and then on to the town of Tailem Bend. It was just out of Tailem Bend that I turned left onto the Mallee Highway, which is the main highway between Adelaide and Sydney. 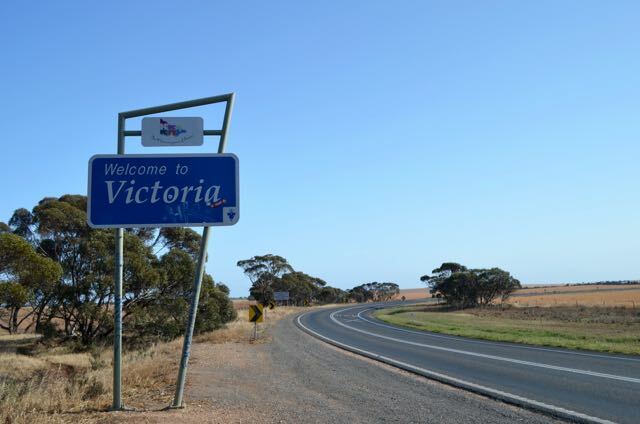 My drive from there would take me east on the Mallee Highway through the little South Australian towns of Moorlands, Sherlock, Peake, Jabuk, Geranium, Parrakie, Lameroo, Parilla, and finally Pinnaroo before reaching the South Australian/Victorian border. I briefly stopped at the little town of Peake to have a look at ‘Pollys Well’ which was sunk by John Whyte, and was an important watering point for Moorlands Station. During the 1900’s, early farming settlers depended upon ‘Pollys Well’, as it would take a total of 8 days to travel by bullock wagon, between Tailem Bend and Pinnaroo. I continued on to the Victorian border where I stopped for a stretch of my legs and a brief photo opportunity. I next stopped at the Victorian town of Murrayville which is about 24 km from the border. The town is the birthplace of Australian Olympic basketballer, Rachael Sporn. There is a great tourist stop here with some interpretive signs explaining about the local National Parks and the rare Mallee Fowl which can be found int he park. Following after Murrayville, are some other interesting little towns including Cowangie, Underbool and then Walpeup. Cowangie is the birthplace of V8 Supercars driver, Larry Perkins. 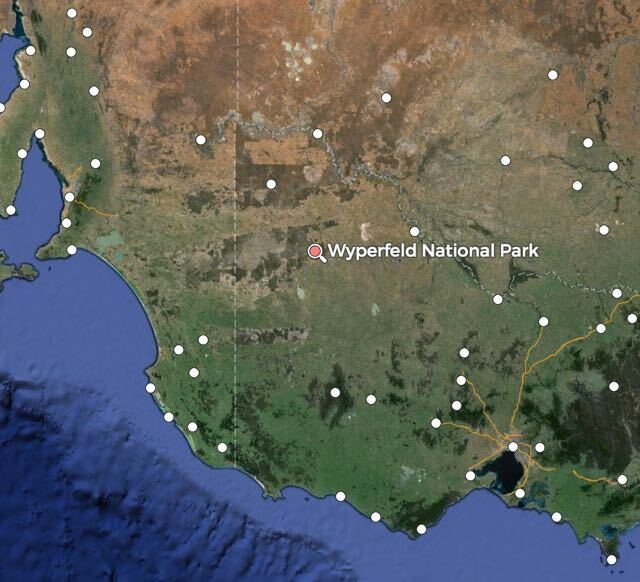 Wyperfeld National Park is located in the flat, semi arid western corner of Victoria. It is a very big park consisting of 360,000 hectares. Pressure from naturalists inspired the government to reserve 3,900 hectares in 1909. It was proclaimed in 1921. The name is of German original and was most likely given by German settlers who cane to the Wimmera Mallee region from South Australia. The park contains a chain of lake beds which are connected by the normally dry Outlet Creek, which is the northern extension of the Wimmera River. About 450 species of native plants occur in the park. Over 200 species of birds have been recorded in Wyperfeld. I was set up and ready to go by 10.00 a.m. Victorian local time. It had just gone past midnight UTC. For this activation I ran the Yaesu FT-857d, 40 watts, and the 30m/20m linked dipole supported on the 7m telescopic squid pole. I headed for my nominated operating frequency of 7.144 and called CQ. My first contact was with Mick VK3PMG who was very very strong from Stawell in Victoria. This was followed by Adrian VK5FANA who was a good 5/8 from Arthurton on the Yorke Peninsula. Next up with Tom VK5EE in Mount Gambier who was 5/9. My ninth contact was with Julie VK3FOWL who was operating portable at a primary school where she shares her interest in the hobby of amateur radio with students. So I took the time to have a chat with young Isobel and Carla at the school in Ormond. I went on to work a further 9 stations on 40m, but it then went very quiet. I had just started lowering the squid pole and was about to remove the links when I was called by Mark VK7MK who was way off frequency. I responded to Mark but unfortunately he didn’t come back to me despite a few attempts at calling him in. So I then removed the links in the dipole and called CQ on 14.310. This was answered by Brett VK2VW with a good 5/8 signal. This was followed by Adam VK7VAZ and then park stalwart Rick VK4RF. After about 50 minutes in the park it was time to pull stumps and get back on the road, I still had a 200 km drive ahead of me. I had qualified the park and had a total of 23 contacts in the log. Last Thursday (22nd October 2015) I headed off bright and early for Balranald in New South Wales. My eventual destination was Wagga Wagga for the SOTA and Parks gathering being held at the Wagga Wagga Amateur Radio Club clubrooms. I returned back home on Monday 26th October, 2015, after putting about 2,500 km on the clock on the Toyota Hi Lux. During the trip I activated 2 x Victorian National Parks, 4 x NSW National Parks, 2 x NSW SOTA peaks, and 1 x SA Conservation Park, with a total of 484 contacts. Thanks to everyone who called in. And many thanks to everyone who took the time to spot me. I will post more info and photographs on each activation in the coming week or so. In the past few days I received the certificate below. 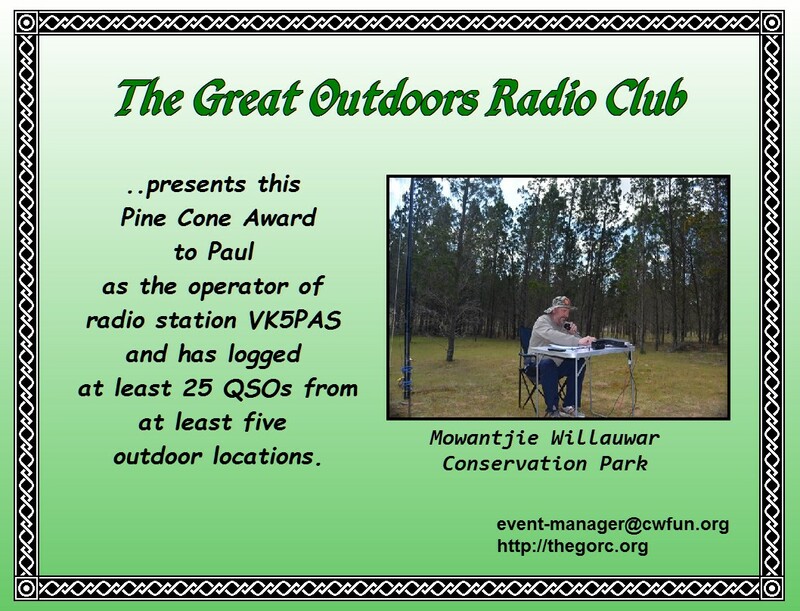 It is the Pine Code Award issued by the Great Outdoors Radio Club (GORC). The certificate is available to members of GORC who operate from an ‘outdoor QTH’. The first Pine Cone is issued for working a maximum of five different stations in a 24 hour period whilst you are in a portable location. You are limited to counting a maximum of five QSOs in a 24 hour period, and are eligible for the first Pine Cone after accumulating 25 QSOs. You can apply for an a second Pine Cone after logging an additional 25 QSOs, and so on, up to a maximum of five Pine Cones. On Sunday 18th October 2015, my wife Marija suggested we go for a drive as it was such a beautiful day. And she hinted to take the radio gear, so I didn’t let the opportunity slip. We packed the 4WD and headed south for the Newland Head Conservation Park on the Fleurieu Peninsula. The park qualifies for the World Wide Flora Fauna program and is VKFF-0922 and also qualifies for the VK5 National and Conservation Parks Award. We drove down to the little town of Strathalbyn and then further south through Finnis and then the wine growing region of Currency Creek. We stopped off for a stretch of the legs and a look at the magnificent canoe tree at Currency Creek on the side of the Strathalbyn – Goolwa Road. The tree is a very large River Red Gum and is listed with the National Trust of South Australia. Aboriginal people used wood and bark to construct canoes. The length of this particular trees scar is about five metres, which indicates that the canoe was capable of carrying a number of people. We continued on to the seaside towns of Middleton, Port Elliot and Victor Harbor. We again stopped briefly to admire the view of Victor Harbor from Range Road. Newland Head Conservation Park is located about 100 km south of Adelaide and about 15 km south west of Victor Harbor. The park protects two long beaches, Waitpinga and Parsons, along with rocky headlands and surrounding coastal vegetation including the sand dunes. The park takes its name from Newland Head which features prominently at the eastern boundary of the park. The park is about 12 km2 in size and is popular with surfers and fishermen. It is believed that Waitpinga is an aboriginal word meaning ‘Windy Place’. 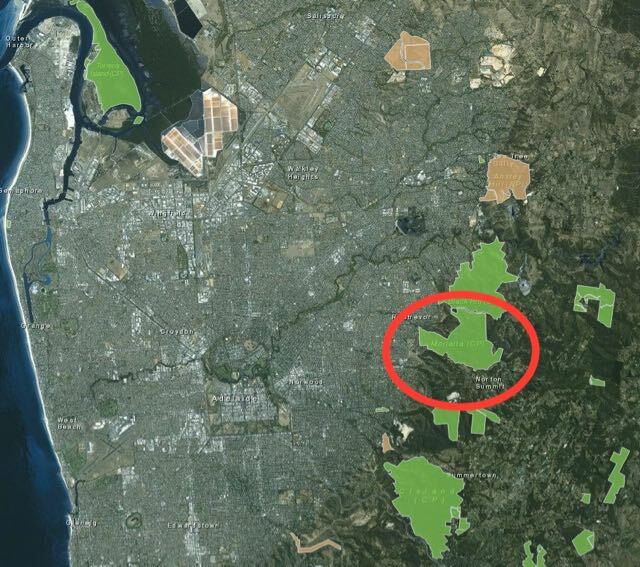 Above:- Map showing the location of the park, south of Adelaide. Map courtesy of SA Maps Viewer. We decided to head to the Waitpinga Beach section of the park, and took a brief photo stop at the corner of Waitpinga Road and Dennis Road. If you continue west along Waitpinga Road, you will reach the Parsons Beach section of the park. The view as you travel along Dennis Road into the park is very nice. The mighty Southern Ocean is visible, as are the sand dunes and the adjacent Waitpinga Creek which flows out into the ocean. Prior to setting up we had a quick look at all the activity on the beach. There were quite a few surf fisherman trying their hand in catching salmon and mullett. You certainly do not want to try swimming here. This is not a swimming beach! If you travelled south, the next piece of land you would reach is Antartica. Waitpinga Beach has rough waves, power rips and not to mention the White Pointer sharks that frequent the area for a feed of fish. There was a fatal shark attack here back in 1989, whilst I was working in the area. We then travelled to the campground area for a look at Dennis Hut which was built in 1890. We then headed back to the Waitpinga Beach carpark and carried the radio gear down the boardwalk and onto the beach. I was the only one on the beach with a squid pole, not doing any fishing! For this activation I ran the Yaesu FT-857d and 40 watts, and the 40m/20m linked dipole supported on my 7 metre telescopic squid pole. Because it was such a sunny day, we even set up the solar panels to keep the 44 amp hour power pack charged up. 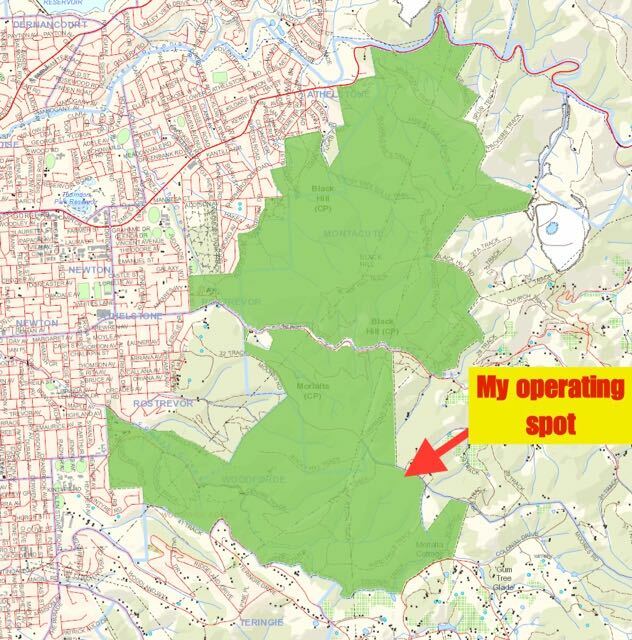 Above:- Map showing my operating spot in the park, south of Adelaide. Map courtesy of SA Maps Viewer. Prior to calling CQ I headed for 7.144 and worked Rob VK4AAC who was operating portable from Karte Conservation Park. Rob had a nice 5/9 signal coming in from the South Australian/Victorian border area. I then moved down to 7.135 and asked if the frequency was in use and this was immediately answered by John VK5BJE in the Adelaide Hills. Next up with Terry VK3UP, followed by Mick VK3PMG who was portable in the Creswick Regional Park, VKFF-0964, north of Ballarat. Band conditions on 40m appeared to be very good and I had a nice steady flow of callers from VK5 and the eastern States of Australia. It wasn’t long before I had another VKFF park in the log. This time it was Dave VK2JDC who was operating portable from the Cattai National Park, VKFF-0092, in the Hawkesbury region of Sydney. Dave had a good strong 5/8 signal coming in to Waitpinga Beach. 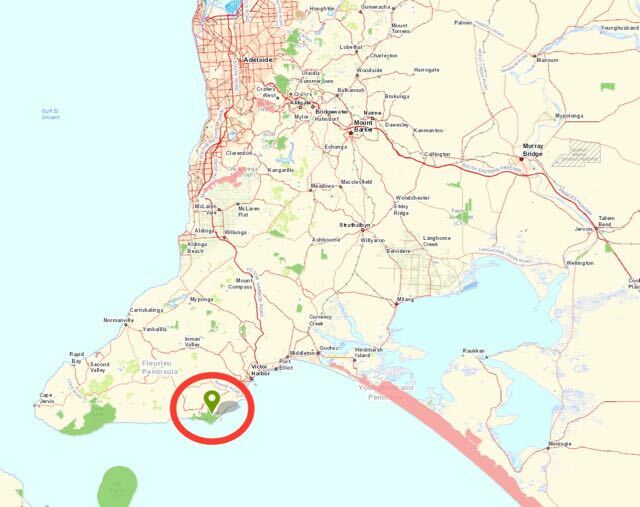 A number of contacts later I spoke with Richard VK5ZRY who was activating the Clinton Conservation Park, VKFF-0813, on the Yorke Peninsula. Richard had his normal 5/9 plus signal. I went on to work a total of 64 stations on 40m in VK2, VK3, VK4, and VK5. This included four parks, and a nice contact with Amanda VK3FQSO who was running just 1 watt and was a very respectable 5/7. I then QSYd to 20m where I worked a total of 49 stations in VK6, Germany, Slovenia, Italy, France, Croatia, Spain, Russia, Latvia, Ukraine, Belgium, Poland, Sweden, Finland, Czech Repiublic, and Switzerland. The only VK caller was John VK6NU (5/5 both ways). My first taker on 20m was Xaver DK4RM. Prior to going QRT I worked special event call, VK2015TDF being operated by Chris VK3FY. I was very happy as I had a total of 113 stations in the log, including some nice contacts into Europe on the long path on 20m. After packing up we headed down Waitpinga Road and to the Parsons Beach carpark, where you can enjoy the excellent views of both Parsons Beach and Waitpinga Beach. There is a small plaque here commemorating Andrew ELLIS who drowned here back in 1986. In fact a number of people have drowned here at Waitpinga and Parsons. You would never catch me swimming here. The sun was just starting to go down in the west. The photos below are looking west along the coast towards Cape Jervis, where you catch the ferry from the South Australian mainland over to Kangaroo Island. On Saturday afternoon (17th October 2015) I activated the Morialta Conservation Park, VKFF-0783, situated in the Mount Lofty Ranges. The park was not my first preference for the day. 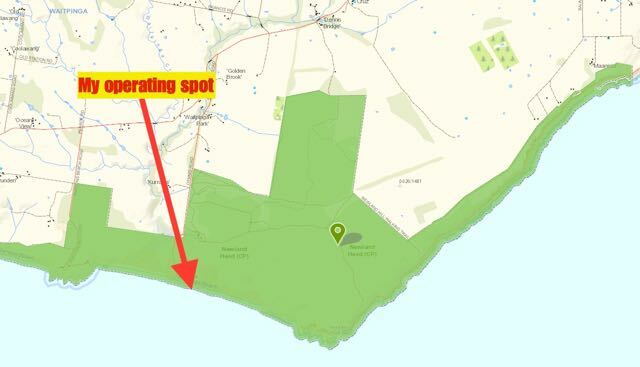 I had nominated to activate the Cleland Conservation Park, but after driving along Summit Road and passed the entrance to the Mount Lofty summit, I found that Summit Road was closed just above the entrance to the Cleland Conservation Park. A speed cop was manning his post at this location and I soon found out that the road was closed due to the Classic Adelaide Car Rally. Bugger! So I turned around and headed all the way back down Summit Road and onto the Piccadilly Road. I stopped off briefly to admire the views out to the east from Summit Road. And although I was very frustrated, the drive through the Piccadilly Valley was very picturesque. The Piccadilly Valley is a market gardening centre which produces food for the Adelaide and overseas market. Premium ‘cool climate’ grape varieties are also grown in the Valley. After reaching the little town of Summertown I turned left and travelled west along Greenhill Road, hoping to access Cleland Conservation Park from the northern side. But sadly, Greenhill Road was blocked off as well. Strike two. 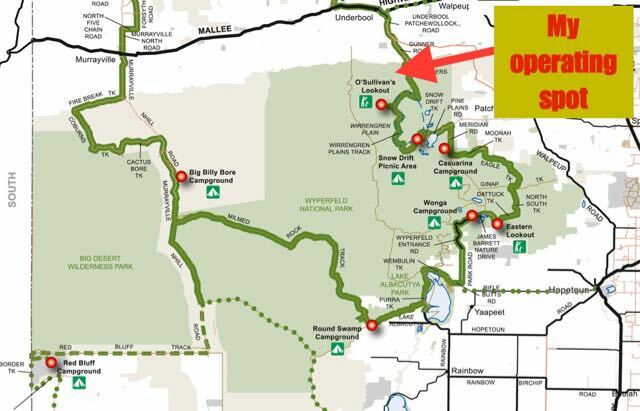 I didn’t feel like driving all the way back to Mount Lofty summit, so I decided to implement plan two, and head for Morialta Conservation Park. Morialta Conservation Park is located about 10 km north east of the Adelaide Central Business District. The park contains some very rugged bush terrain, with a narrow gorge set with three waterfalls which are bounded by steep ridges and cliffs. It is truly an amazing park, right on Adelaide’s doorstep. It is believed that the Morialta Conservation Park derived its name from the aboriginal Kaurna word, ‘moriatta’, meaning ‘ever flowing’ or ‘running water’. However other linguists suggest the name was derived from the Kaurna words ‘mari yeertalla’ meaning ‘eastern cascade’. A number of activities are undertaken in the park including bushwalking, bird watching and rock climbing. Wednesday 15th July 2015 marked the 100 year anniversary of the proclamation of Morialta Falls as a National Pleasure Resort. It later became a National Park in 1966/67, and then became the Morialta Conservation Park in 1972. The park is steeped in history. Between 1915 to 1956 a tram ran from Adelaide to the western entrance of the park. Above:- Map showing the location of the park. Map courtesy of SA Maps Viewer. I drove to the little town or Norton Summit and then travelled west along Norton Summit Road which straddles the southern edge of the park. But there was no where for me to park the car and the terrain along this section was just way too steep to activate from. So I headed back into Norton Summit and turned left and travelled north along Colonial Drive. This took me passed the historic Morialta Barns. This was the site of the former Morialta Old Winery complex. The buildings were constructed by South Australia’s second Premier, John BAKER, who was a businessman, parliamentarian and pastoralist. The Barms were part of the Morialta House Estate built by BAKER, where he established a farm and orchard. 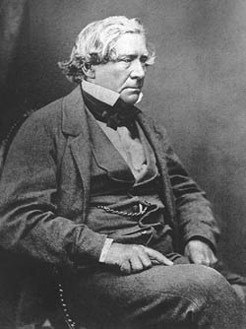 By the 1860s, Baker had established vineyards and was exporting his wine to London. Guests to Morialta House included the Duke of Edinburgh and future King George V. Baker also built a hilltop horse racing track, on which he trained the winner of the 1873 Melbourne Cup, Don Juan. Today the buildings are listed on the State Heritage Register, and are of State Heritage significance, dating from the second decade of colonial South Australia. The Barns were most recently used as a winery, but they were recently sold. I guess thats what all the scaffolding was about. This impressive complex of stone buildings includes two barns (one 3 storey and the other 2 storey), a well house, a bake house, a dairy, stables, a stoned walled enclosure around the barns, and the original stables and coach house. The Barns also accommodate a poultry shed, an old piggery, and a few other small farm buildings. The site itself has impressive views across the valley to the east. 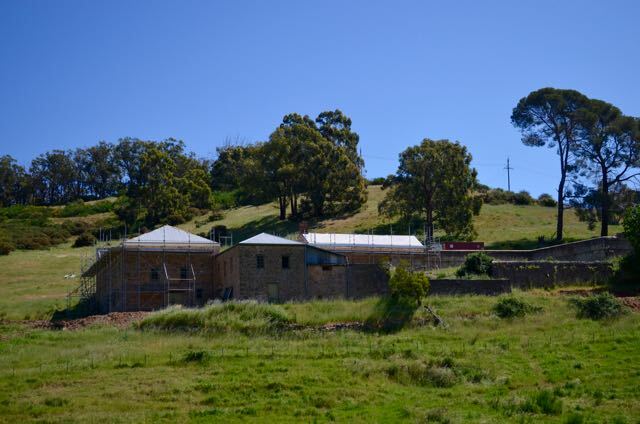 These functional stone buildings are excellent examples of the early colonial agricultural and viticultural structures of South Australia. I then drove passed the historic Morialta Cottage on Colonial Drive. 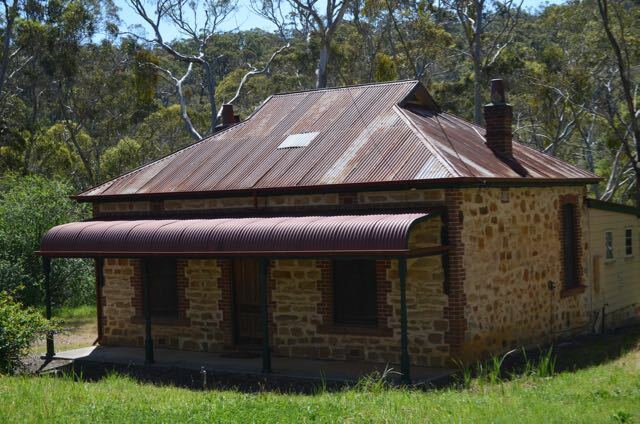 This is often confused for the Morialta Homestead built by John Baker in 1847. This is a beautiful drive through this section of the Adelaide Hills. I highly recommend it to anyone who would like a nice weekend drive. A small creek follows the road which is lined by beautiful tall gum trees with an understorey of other plants including ferns. I drove on to Moores Road and followed the northern boundary of the park. Moores Road is a dirt road, but is perfectly suitable for a conventional vehicle. Moores Road becomes a no through road. At the end is a large parking area. This is where I parked the 4WD and I climbed the boundary fence and set up the gear. For this activation I ran the Yaesu FT-857d, and the 40m/20m linked dipole supported on the 7 metre squid pole. Above:- Map showing my operating spot in the park. Map courtesy of SA Maps Viewer. As it was Springtime, many of the local native plants were out in flower. It was a beautiful spring day with the temperature being about 30 degrees C. And not a cloud in the sky. 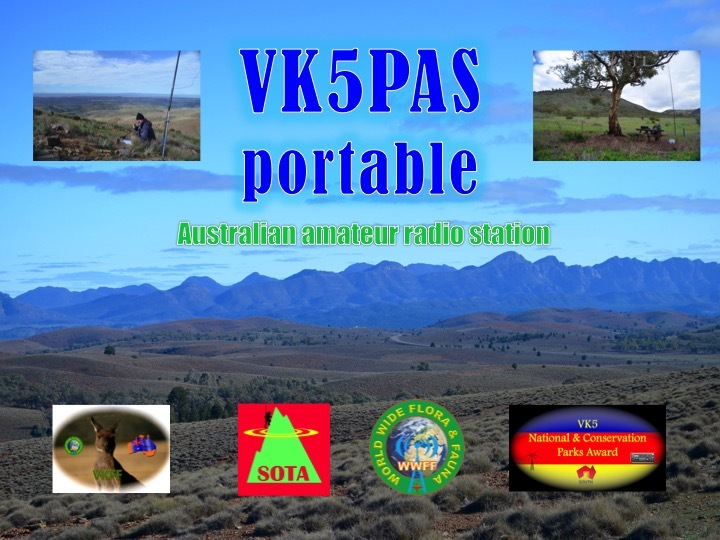 After setting up I headed to 7.144 and found that it was already occupied by Rob VK4AAC who was booming in from Peebinga Conservation Park, VKFF-0830, near the South Australian/Victorian border. After working Rob I headed down the band to 7.135 and started calling CQ. My CQ call was immediately answered by a number of stations who had followed me down the band. First up was Tony VK3VTH mobile with a good strong 5/8 signal, followed by Mick VK3PMG, Roy VK5NRG, and then John VK5BJE. About 15 minutes into the activation I was called by John VK2WG who was operating portable from the Fusion 15 Multicultural Festival at Wagga Wagga. Unfortunately John was struggling a little with my signal over to New South Wales. I also spoke with Ian VK5IS who was operating portable as part of the Jamboree on the Air (JOTA) weekend. I spoke briefly with Mckay, a young 8 year old cub to enable him to qualify for a badge. A few QRP stations also called in, including Greg VK5GJ running his normal 4 watts from Meadows, Nev VK5WG up in the Mid North operating with just 5 watts, and Gary VK5PCM operating with just 2 watts. All had good signals into the park. After working a total of 45 stations on 40m in VK1, VK2, VK3, VK4, VK5, and VK7, I lowered the squid pole and removed the links and headed to 20m. I called CQ on 14.295 and this was answered by Bill VK4MWG with a very strong 5/9 plus signal. Bill was kind enough to spot me on the DX cluster which brought in the DX. But not before I worked Steve VK5SFA who lives near the western boundary of the park. My first DX contact was with Luciano I5FLN in Italy, followed by Xaver DK4RM in Germany, and then Emilio IZ8VYU in Italy. All with great signals. I went on to work a total of 50 stations on 20m in VK4, VK5, VK6, Italy, Germany, Slovenia, France, Czech Republic, Croatia, Russia, Sweden, Lithuania, Ukraine, Belgium, Poland, Netherlands, England, Balearic Islands, and Indonesia. Band conditions on 20m were quite good, with signals long path from Europe quite strong. I did note that the Over the Horizon Radar (OTHR) was present intermittently on the band, and was very strong. I also suffered a little bit of QRM about half way through the pile up. A couple of German speaking stations came up just 1 kc above me and they were very strong. They didn’t stick around for too long, as they were politely told by a number of the Europeans to QSY. It did take about 5 minutes but eventually they bowed to the pressure and moved up higher in the band. Apologies to the European stations that were calling me that I was struggling with. The QRM was just too severe. I then moved back to 40m to hopefully pick up some of the die hard park desperados. And it didn’t take long. First taker was Hauke VK1HW, and this was followed by park stalwart Rob VK4FFAB. 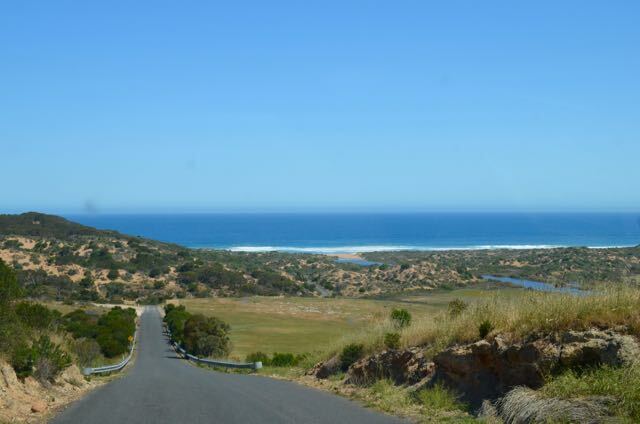 I also spoke to another park devotee, Adrian VK5FANA on the Yorke Peninsula. On my second round on 40m I worked a total of 11 stations before going QRT. The sun was down behind the trees and the ridgeline and it was getting quite cold (11 degrees C). The 40m band was just opening up to North America, but it was getting very cold, so I didn’t persevere. I also heard V73D in the Marshall Islands on 7.182 working split with a great signal. But he had a massive pile up, with stations calling from Australia, North America, and Japan. I had a total of 106 contacts in the log. I have just had a new VK5PAS portable QSL card printed up by Gennady UX5UO from UX5UO Print. The new QSL card will be available for all DX stations via my QSL Manager, Charles M0OXO in the UK. 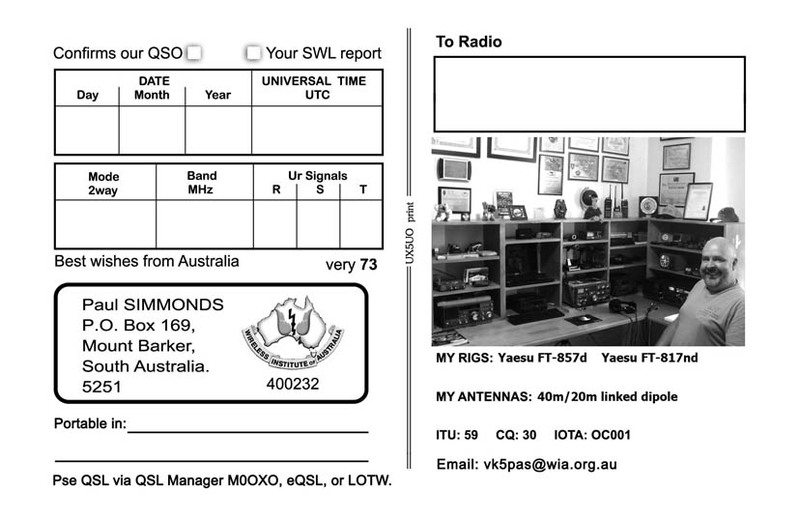 For VK’s, should you like a VK5PAS portable QSL card, please send me a Stamped Self Addressed envelope to…. PO Box 169, Mount Barker, SA. 5251. Here’s what the front of the card looks like……..
And the rear of the QSL card…..